Many people have questioned the importance of teaching spelling in an age when our computers and our phones often have spelling checkers and suggested words always available. Of course, these gadgets can suggest and approve words that are totally inappropriate to the context, frequently with comical results. There is an underlying question about the significance of spelling skills for literacy, reading comprehension, reading fluency, and writing skills. This article summarizes the research underlying the question of how spelling skills, such as automaticity, build reading fluency and comprehension. It addresses the question of the research base for the activities provided by VocabularySpellingCity. Reprinted with permission from the International Dyslexia Association quarterly newsletter, Perspectives, Winter, 2002, vol. 28, no. 1, pages 9-14. IDA website: www.interdys.org. The reading process involves two separate but highly interrelated areas – word identification and comprehension. It is well established that difficulties in automatic word recognition significantly affect a reader’s ability to effectively comprehend what they are reading (Lyon, 1995; Torgeson, Rashotte, and Alexander, 2001). Even mild difficulties in word identification can pull attention away from the underlying meaning, reduce the speed of reading, and create the need to reread selections to grasp the meaning. Many students who struggle to learn to read are able, with appropriate instruction, to compensate for initial reading problems by becoming accurate decoders but fail to reach a level of sufficient fluency to become fast and efficient readers. Thus, the development of techniques for improving automaticity and fluency is critical. Although the research is clear that a systematic alphabetic approach to teaching beginning readers is more effective than a whole word approach (Adams, 1990; Chall, 1996; Snow, Burns and Griffin, 1009), the most effect ways to develop fluency are less well understood. Although current research has given us some direction about effective methods for increasing fluency (National Reading Panel, 2000), further systematic research is needed to give us more comprehensive answers to questions concerning the best methodologies, types of materials, and length/intensity of interventions necessary for optimal gains. The purpose of this article is to suggest some techniques that are consistent with the research and have been found to be either clinically effective or logically appropriate. The ability to read fluently develops during Jeanne Chall’s Stage 2 of reading, Ungluing from Print, which for most students occurs around second to third grade. (For a complete discussion of Chall’s stage theory of reading acquisition, please see Chall, 1983.) 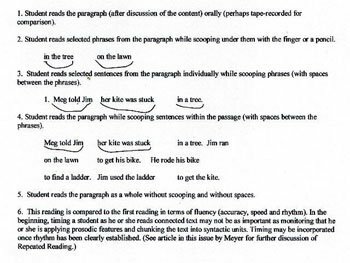 This is the last stage where the student is developing skills related to “learning to read” and after this stage, the child will be required to shift to an emphasis on “reading to learn.” The type of text being read shifts from being primarily narrative to expository and the language complexity of the written material begins to increase dramatically (including vocabulary level, sentence complexity, and text structure). The importance of background knowledge for comprehension also increases. Fluent reading at this point is essential. Phonics, and Sight Word Recognition Skills. Most children go through this process relatively seamlessly, moving easily from the use of alphabetic strategies to the formulation of strong orthographic representations that can be accessed automatically. There is, however, a percentage of “at risk” children (approximately 20-40% depending on the specific school demographics) who benefit from having phonemic awareness and phonic word attack strategies systematically taught. There is also a smaller percentage of children who will need more intensive work in this area (See Sanders 2001 for a more in-depth discussion). The children who struggle the most with learning to read also fail to develop adequate automaticity (orthographic reading) and need structured, systematic training in this area. It appears that early preventive intervention may be particularly important in the development of automaticity and fluency (Torgeson et al, 2001). (closed in by a consonant – vowel makes its short sound. It is these letter (orthographic) patterns that signal vowel pronunciation. For example, while one or more consonants at the end of a syllable (closed syllable type) signals a short vowel sound, a vowel at the end signals a long vowel sound, etc. Highlighting, underlining, or enhancing the saliency of the visual pattern in some way is recommended to direct the student’s attention to the critical components of the orthographic image. Students must become able not only to apply their knowledge of these patterns to recognize the syllable types, but to see these patterns automatically, and ultimately read words as wholes rather than through the application of word attack strategies. 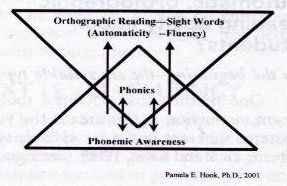 This need to move from decoding to automatic recognition was recognized years ago by Anna Gillingham when she incorporated the Phonetic Word Cards activity into the Orton-Gillingham lesson plan (Gillingham and Stillman, 1997). This activity involves having the student practice reading words (and some nonwords) on cards as wholes beginning with simple syllables and moving systematically through the syllable types to complex syllables and two-syllable words. The words are divided into groups that correspond to the specific sequence of skills being taught. A teacher can begin to practice listening for and producing accented syllables using the alphabet. The alphabet is presented in pairs and one letter of the pair is accented until a student is successful. The teacher begins presenting the accent only on the first letter until the student is consistent and then presents the accent only on the second letter. When a student can do both of these successfully, the teacher can then present mixed pairs to practice (e.g., A‘B C‘D EF or GH‘ IJ‘ KL‘ or M‘N O P‘ Q‘R). Instruction should move as quickly as possible from using the alphabet to using real words. The teacher can begin with names to practice listening for accented syllables (e.g., Court‘ ney, Michelle‘, Ty ler, Je sus‘). Approaches have been developed that use a variety of repeated reading strategies to strengthen these orthographic images.The automatic recognition of single graphemes is a critical first step to the development of the letter patterns that make up words or word parts (Adams, 1990). English orthography is made up of four basic kinds of words: 1) regular for reading and spelling (e.g., mat, sprint; 2) regular for reading but not for spelling (e.g. boat, rain – could be spelled “bote” or “rane” respectively); 3) rule based (e.g., planning – doubling rule, baking – drop e rule); and 4) irregular (e.g. beauty – it should be noted that most parts of an “irregular” word are actually regular and only the irregular part needs to be specifically addressed). Students must learn to recognize all four types of words automatically in order to be effective readers; thus, techniques for developing strong orthographic representations for all types of words are essential. Extensive opportunity for repeated practice in pattern recognition is often necessary. In order to strengthen the letter patterns associated with the six syllable types and other rule based orthographic patterns in English (such as e, i and y signalling the pronunciation of c and g, Fischer (1994) has developed drills to “train the orthographic processor” which involve having the student mark the vowels long or short based solely on the letter patterns contained in the word. They do not actually read these words, but instead focus attention on the letter pattern. The next step is to “link the phonological and orthographic processors” which involves saying only the vowel sound of the words rather than reading the word. Again, the focus is primarily on the orthography. Other ways of emphasizing orthography would be card sorts where students sort different syllable types into appropriate categories as quickly as possible and then say the vowel sounds of each syllable type as quickly as possible. These same kinds of speed drills can be used for irregular words as well as multisyllable words that incorporate higher-level concepts of structural analysis (prefix, stem, and suffix). At the multi-syllable level, automatically recognizing both the visual patterns related to syllable division as well as prefixes, stems, and suffixes (larger chunks) can be very helpful. The syllable division rules around vccv and vcv syllable patterns can train the student to recognize visual patterns that signal pronunciation. The SPIRE program contains speed drills that at first mark these syllable breaks as well as prefixes and suffixes and then fade the cues as the student progresses through the skill. Not only do good readers read fluently with adequate speed, but when they read aloud, they also use appropriate phrasing, intonation, and their oral reading mirrors their spoken language. In addition to repeated readings of words or word parts, specific techniques have been developed to strengthen the orthographic representations by the use of multisensory activities that link the motor and visual modalities to reinforce the auditory. Tracing, copying, and writing words have long been a part of many multisensory, structured language approaches (e.g., see Gillingham and Stillman, 1997 and Raines 1980 for a complete discussion of these techniques.) Sky writing, which involves using gross motor movements of the whole arm to form letters in the air, has also been used to help reinforce single letter formation by combining visual, auditory and tactile-kinesthetic cues. More recently an air writing technique has been included as a component of a program intended to improve symbol imagery, or the formation of orthographic representations (i.e., Seeing Stars Nanci Bell, 1997). This technique involves having the student look at a word or word part pronounced by the teacher, name the letters, and then use his finger to write the word in the air directly in his visual field while looking at his finger. The student then reads the word from memory and the teacher questions him about the order and placement of specific letters in the word (e.g., “What is the third letter in the syllable?” “What is the second letter?” etc.). The emphasis here is on enhancing the students’ ability to “see” the letter patterns in their minds. Fluency training helps a student to connect the prosody of spoken language to the prosodic features of text that are signaled through punctuation. There are features present in spoken language that provide clues to a speaker’s intent such as gestures, facial expression, intonation, and stress that are not present in printed text. The absence of these prosodic features in text inhibits some readers from chunking words (grouping by semantic and syntactic features) into meaningful units. Just as we teach students to make sound-symbol correspondence during decoding instruction, we also must teach readers to map the prosodic features of spoken language onto the printed text. Structured and systematic instruction in this area will facilitate spoken-to-print prosodic correspondences and enhance comprehension. This strategy can also be used while increasing the length of phrases and emphasizing the different meanings (e.g. Get out of bed. Get out of bed. Get out of bed now.) Teachers can also practice fluency with common phrases that frequently occur in text. 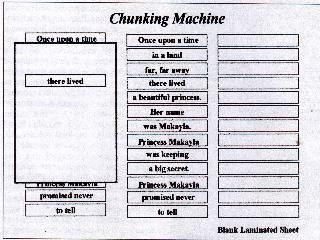 Prepositional phrases are good syntactic structures for this type of work (e.g. on the _____, in the _____, over the ________etc.). Teachers can pair these printed phrases to oral intonational patterns that include variations of rate, intensity, and pitch. Students can infer the intended meaning as the teacher presents different prosodic variations of a sentence. For example, when speakers want to stress a concept they often slow their rate of speech and may speak in a louder voice (e.g. Joshua, get-out-of-bed-NOW!). Often, the only text marker for this sentence will be the exclamation point (!) but the speaker’s intent will affect the manner in which it is delivered. Practicing oral variations and then mapping the prosodic features onto the text will assist students in making the connection when reading. Teachers can then move to simple two-word or three-word sentences. The sentences are punctuated with a period, question mark and exclamation point and the differences in meaning that occur with each different punctuation mark (e.g.Chris hops. Chris hops? Chris hops!) are discussed. It may help students to point out that the printed words convey the fact that someone named Chris is engaged in the physical activity of hopping, but the intonational patterns get their cue from the punctuation mark. The meaning extracted from an encounter with a punctuation mark is dependent upon a reader’s prior experiences or background knowledge in order to project an appropriate intonational pattern onto the printed text. Keeping the text static while changing the punctuation marks helps students to attend to prosodic patterns. For older or better readers, teachers can mark the phrasal boundaries with slashes for short passages. Eventually, the slashes are used only at the beginning of long passages and then students are asked to continue, “phrase reading” even after the marks stop. Marking phrases can be done together with students or those on an independent level may divide passages into phrases themselves. Comparisons can be made to clarify reasons for differences in phrasing. Teachers can change the punctuation and vary intonation of paraphrases to increase student’s ability to quickly adapt to changes. Discussion can focus on the differences between “jumped over the bushes” and “leaped over the hedge.” “Leaped” is a somewhat more interesting image so students might give it more stress during oral reading. They could then replace it with “bounded over the shrubbery” and discuss if this paraphrase changes the meaning and practice reading it. Because texts in different content areas tend to contain slightly different syntactic patterns, diverse reading of undemanding materials in different subjects and genres can be valuable during activities for improving fluency and comprehension. Adams, M.J. (1990). Beginning to read: Thinking and learning about print. Cambridge, MA: MIT. Chall, J. (1996). Learning to read: The great debate (Third Edition). New York: McGraw-Hill. Bell, N. (1997). Seeing stars. San Luis Obispo, CA: Gander Educational Publishing. Clark-Edmands, S. (1998). Specialized program individualizing reading excellence (SPIRE). Kennebunk, ME: Progress Learning, Inc.
Fischer, P.E. (1994). Concept Phonics. Farmington, ME: Oxton House. Frith, U. (1985). Beneath the surface of developmental dyslexia. In Paterson, K.E., Marshall, J.C. and Coltheart, M. (Eds. ), Surface dyslexia: neuropsychological and cognitive studies of phonological reading. Hillsdale, NJ: Lawrence Erlbaum Associates. Gillingham, A. and Stillman, B.W. (1997). Remedial training for children with specific disability in reading, spelling, and penmanship. Cambridge, MA: Educators Publishing Service. Greene, J.F., and Woods, J.F. (1993). J and J language readers. Longmont, CO: Sopris West. Lyon, G.R. (1995). Towards a definition of dyslexia. Annals of Dyslexia, 45:3-27. National Reading Panel (2000). Teaching children to read: An evidence-based assessment of the scientific research literature on reading and its implications for reading instruction. US Department of Health and Human Services, National Institute of Child Health and Human Development, NIH Pub. No. 00-4753. Pearson, P.D. and Johnson, D.D. (1978). Teaching Reading Comprehension. New York: Holt, Rhinehart, and Winston. Sanders, M. (2001). Understanding dyslexia and the reading process: A guide for educators and parents. Needham Heights, MA: Allyn and Bacon. Snow, C.E., Burns, M.S., and Griffin, P. (1998). Preventing reading difficulties in young children. Washington, D.C.: National Academy Press. Steere, A., Peck, C., and Kahn, L. (1988). Solving language difficulties. Cambridge, MA: Educators Publishing Service. Raines, B.J. (1980). Alphabetic Phonics. Cambridge, MA: Educators Publishing Service. Torgesen, J.K., Rashotte, C.A., and Alexander, A.W. (2001). Principles of fluency instruction in reading: Relationships with established empirical outcomes. In M. Wolf (Ed. ), Dyslexia, fluency, and the brain. Timonium, MD: York Press. Wood, F.B., Flowers, L., and Grigorenko, E. (2001). On the functional neuroanatomy of fluency or why walking is just as important to reading as talking is. In M. Wolf (Ed. ), Dyslexia, fluency, and the brain. Timonium: York Press. Carreker, S. (1999). Teaching reading: Accurate decoding and fluency. In J.R. Birsh (Ed. ), Multisensory teaching of basic language skills. Baltimore, MD: P.H. Brookes. Honig, B., Diamond, L., and Gutlohn, L. (2000). Teaching reading: Sourcebook for kindergarten through eighth grade. Novato, CA: Arena Press. Pamela E. Hook, Ph.D. is an Associate Professor in Communication Sciences and Disorders at the Massachusetts General Hospital Institute of Health Professions, a graduate-level training program in speech-language pathology and reading. Her research interests include the relationship between oral and written language, auditory processing and nonverbal learning disabilities. She has been a consultant to schools, designing language arts curriculum, training teachers, and working with parents. She also designs computer software to teach phonemic awareness and reading skills. Sandra D. Jones, Ph.D. is the Program Coordinator for the Hanson Initiative for Language and Literacy (HILL), a whole school model for professional development, research and educational outreach that is affiliated with the MGH Institute of Health Professions. She has conducted research in the areas of auditory, visual, and cognitive intervention strategies for dyslexic students. She has been a consultant to schools in the areas of literacy, learning disabilities, behavior management, technology, strategic planning and group facilitation techniques, and policy.